So, off I went. 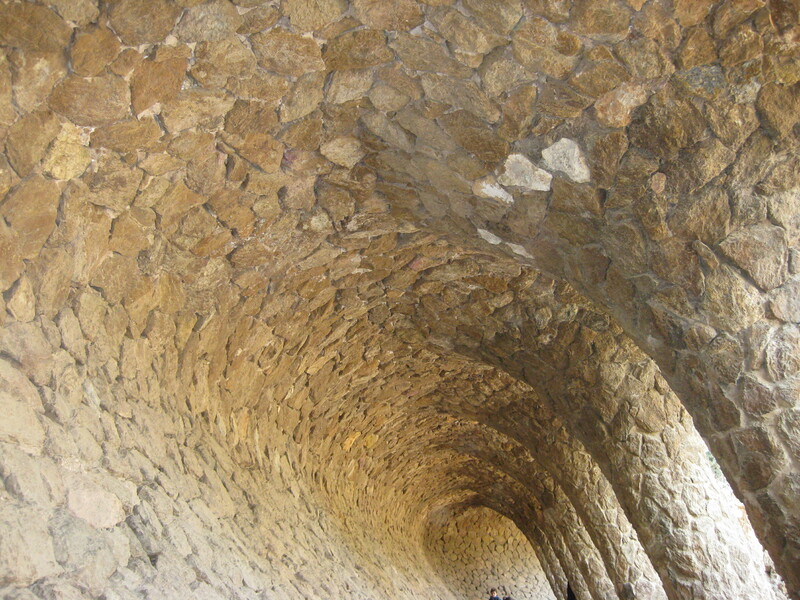 First stop: Parc Guell. If you’re familiar with this park, you can skip the next couple of paragraphs and lengthy pictures. 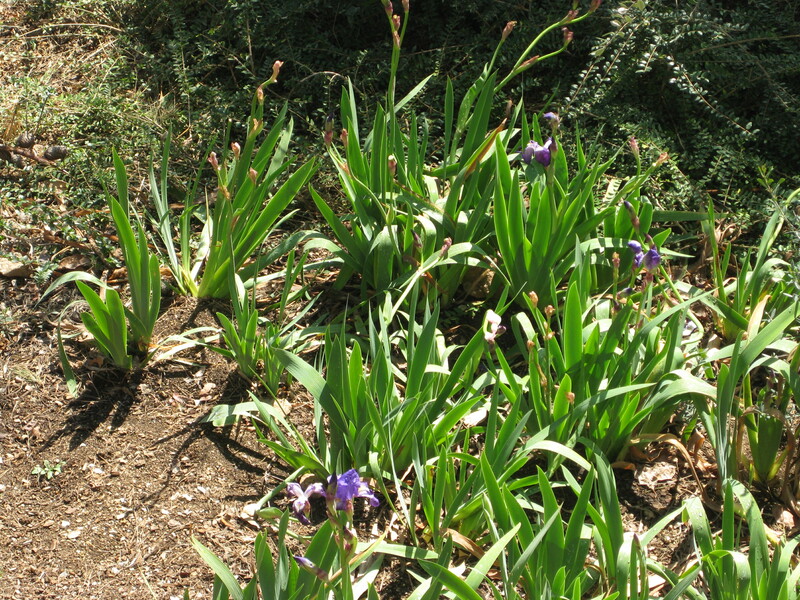 In the early 1900s, the park was originally designed, unsuccessfully, as a commercial housing site. 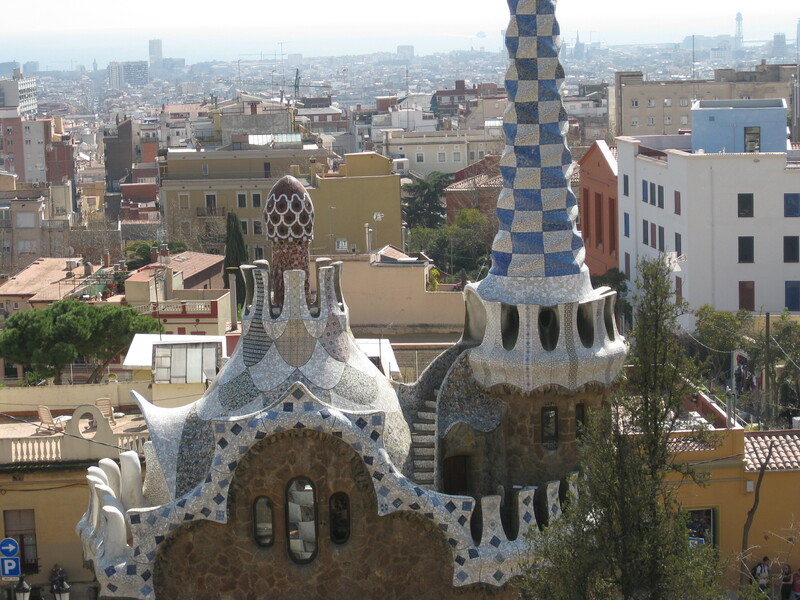 That didn’t take, so it was converted to a park, with lovely walking trails and Gaudi’s signature style dispersed throughout. When I look at his creations in this park, it reminds me of being in a fairy tale – mosaics; dragons; lots of lovely, curvy, intensley colorful designs. A few pics are below (and one at top). Ahhh, very pleasant on such a sunny and magnificent day. 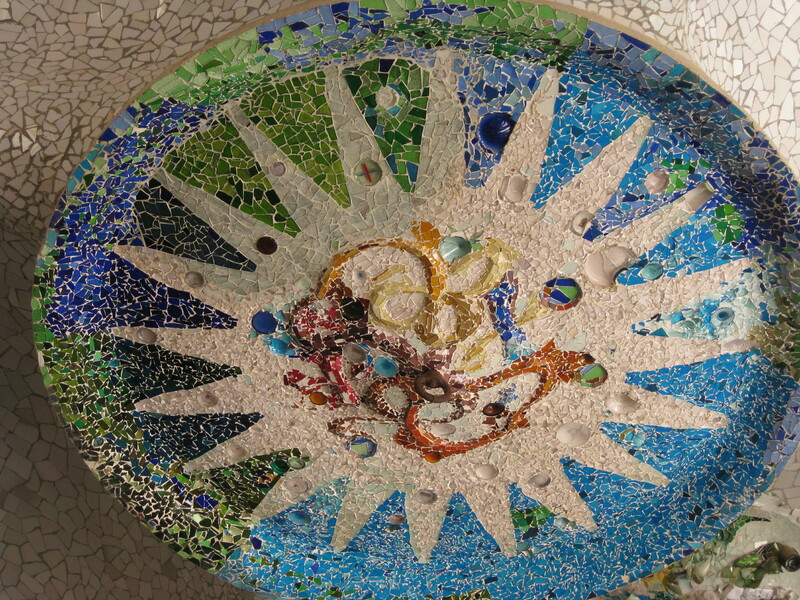 There were other school groups of older kids, as well, and I wondered whether it was bring your school to Park Guell day? No matter, after 2 hours of walking, it was time to rip into my lunch. 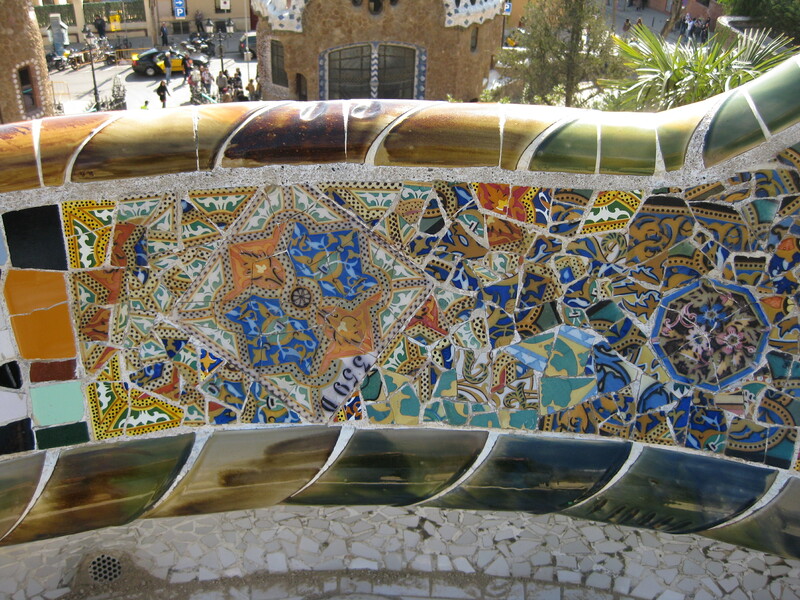 I sat on the winding, mosaic-laden bench, below. Spectacular. Sitting there, contemplating art, eating my local lunch, and basking in the sun. Ahhhhh. The bonus was my lunch stayed put. No problems whatsoever. All in all a very successful outing. So, off I go to what I think will be a place far less filled with school children – Fundació Joan Miró. When I first went to Barcelona 20+ some years ago, I fell in love with Joan Miró. I was there during semana santa and there were Miró posters all over the city. A 2 sentence history lesson for those who haven’t heard of him: Born in Barcelona in 1893, he became a very famous surrealist painter, whose paintings and scuptures were influenced by his home, wars, and the politics of the ages and places he lived. He is said to have had significant influences on American abstract expressionist artists, as his works were often show in New York. I love his early, more colorful paintings that reflect his home: The Farm, The Farmer’s Meal, House with Palm Tree. But, I think the ones I like the most (and I’m guessing they are the most popular) are his 1940-1941 constellation works, especially The Morning Star, Toward the Rainbow, and a few of his women and bird-themed paintings. I wanted to take pictures, but I saw a German guy get in trouble for doing it, so I decided to follow the rules. I spent about 1.5 hours in the galleries, and then went on the long walk back. 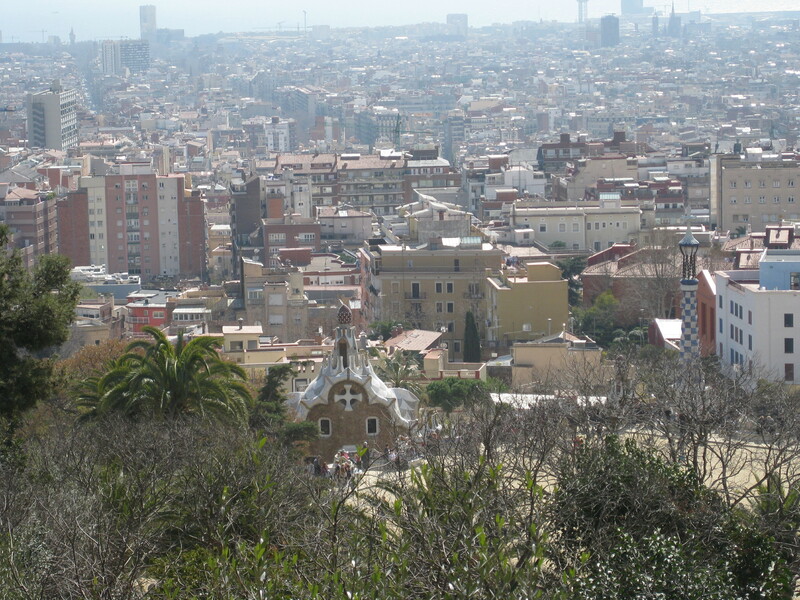 The Fundacio is in a barrio of the city called Montjuic. It was a good walk up the hill, past the Museu Nacional d’Art de Catalunya, and through a couple of different gardens/parks (Jardins de Joan Maragall and Jardins de Laribal). I fully enjoyed all the walking on such a gorgeous day. Then, even though I thought I was done walking for the day, Senior Bravo decided to get us lost AGAIN (for the second time ) trying to find a particular tapas bar I wanted to go to. Because Carnet said I am horrible with maps (and I may concede on occasion I tend to go the opposite way even when using GPS), I let Mark map the 2 prior dinners. That boy is worse than I am with maps! The good thing about getting lost is that you see more and you really work up an appetite. However, I get annoyed easily when I’m hungry, so he had to deal with that. We finally made it to the tapas bar and it was too packed to even get inside. People were spilling onto the sidewalk, so we decided to pass and walk up the street to another place whose name I cannot remember. In the bar it had this funky, almost terrarium like floor that had glass over it and underneath the glass there was a sea of greens and green-blues. That was cool. My food was excellent! 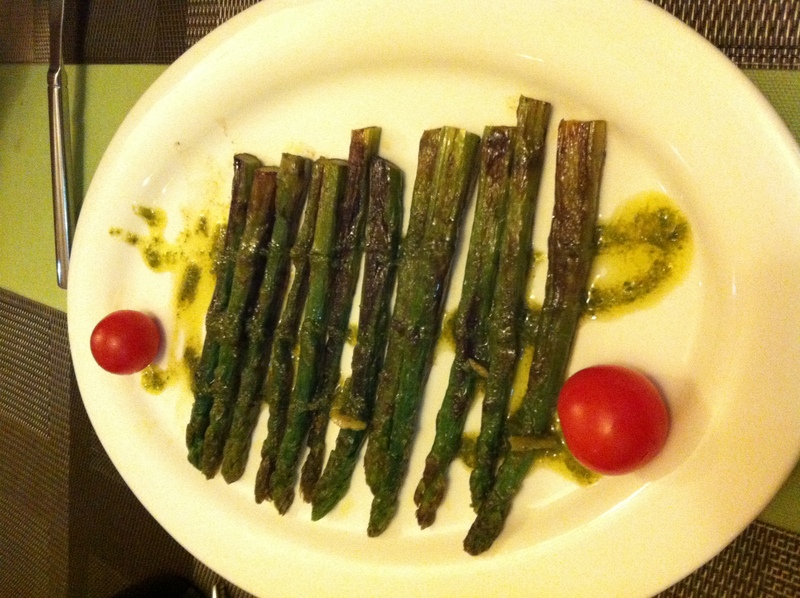 I had a salad with goat brie, nuts, raisins, lambs lettuce, apples and a sweet balsamic reduction, grilled asparagus with albahaca sauce (fresh basil, oil, and garlic – sort of like a pesto), and what they called mountain lamb in rosemary. I had no idea what mountain lamb was, but I’m adventurous so I thought I’d give it a go. I was just praying to the food gods it wasn’t something like rocky mountain oysters. It wasn’t! 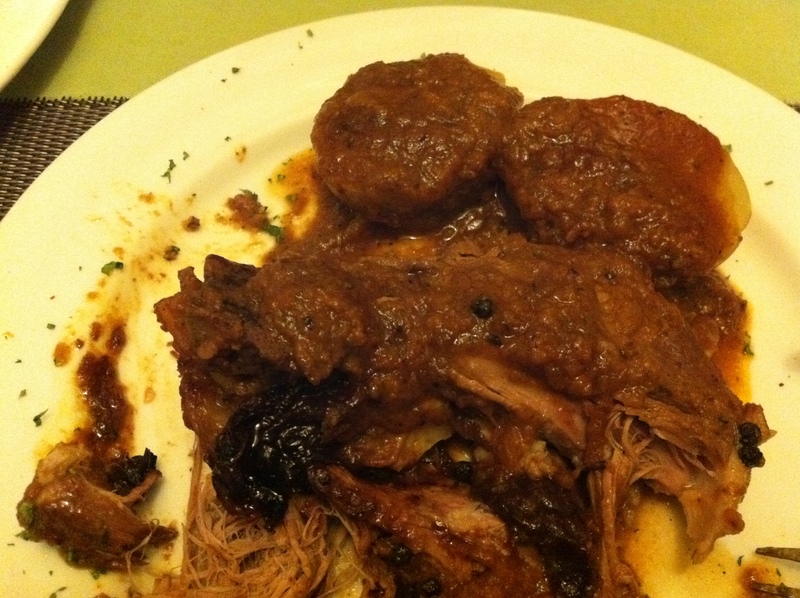 It was actually this beautiful cut of lamb that had obviously been braised for hours, as it was super tender and the sauce they put on top of it was heaven. I have no idea what was in the sauce (I should have asked! 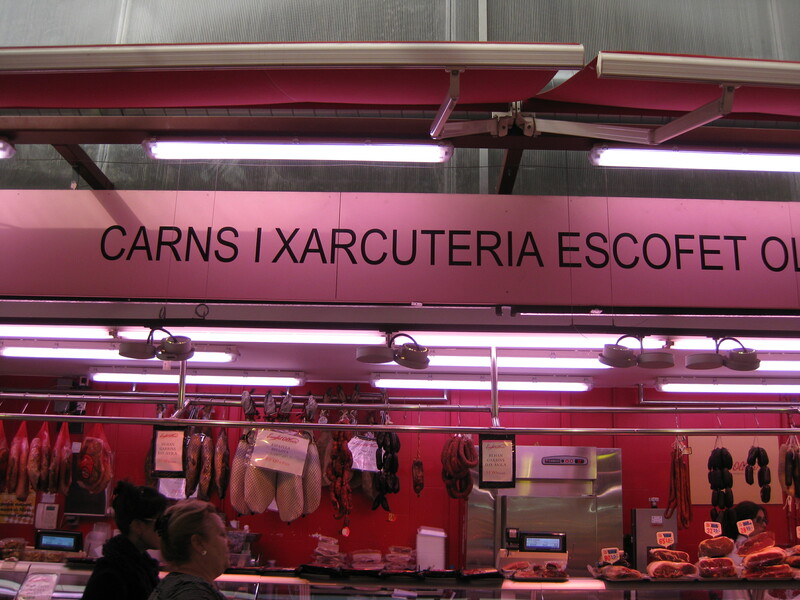 – duhh) but I will definitely go back there when I need a lamb fix. Here are the pics, below. Today, Mark and I are suppose to go to a microbrew festival, but my cold is getting a bigger grip on me than I had hoped, so I’m going to rest at the apartment all day and stay away from other people and alcohol. Plus, I just bought tickets to go see C in London next week, so I have to get better quickly! Tourist or local – either is good! 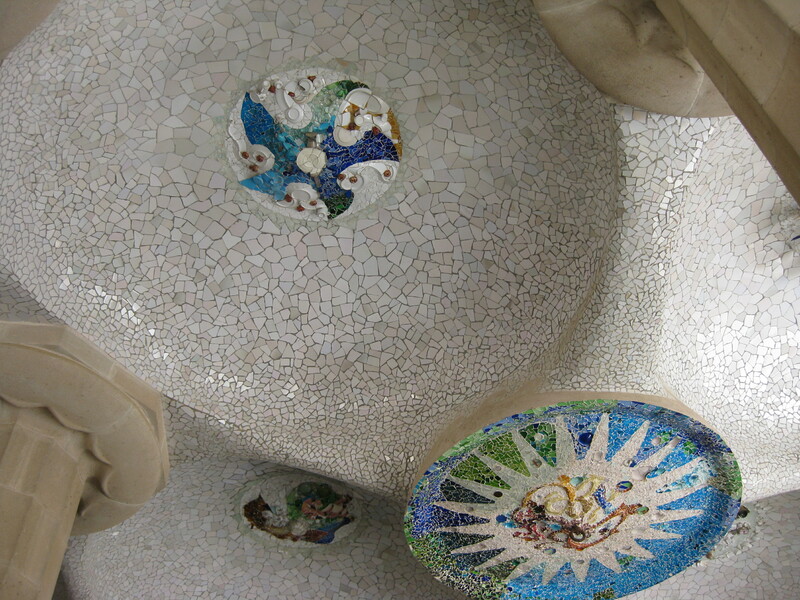 Gaudi – Miro a wonderful day. Can’t wait until you go to the Dali Museum. 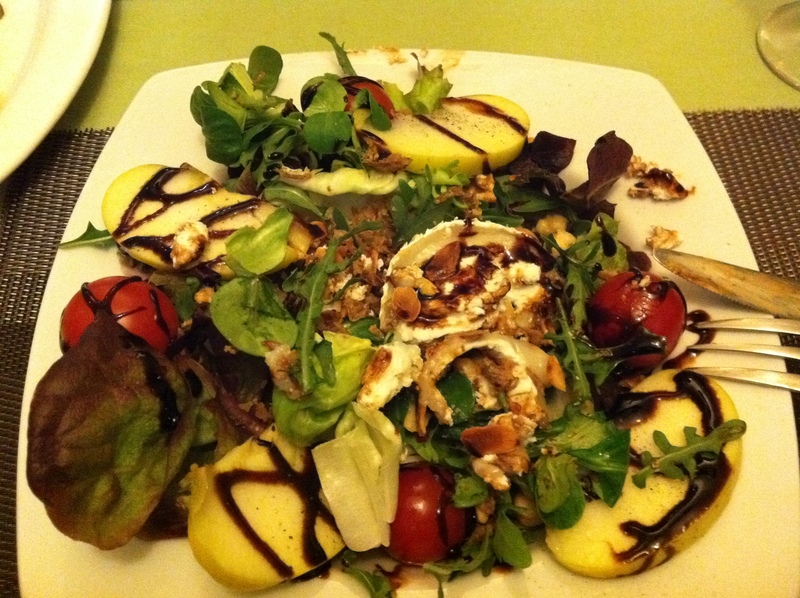 I take that back . . .rest first, eat lots of fruit and veggies – give Carnet a hug from us – and then the Dali Museum! 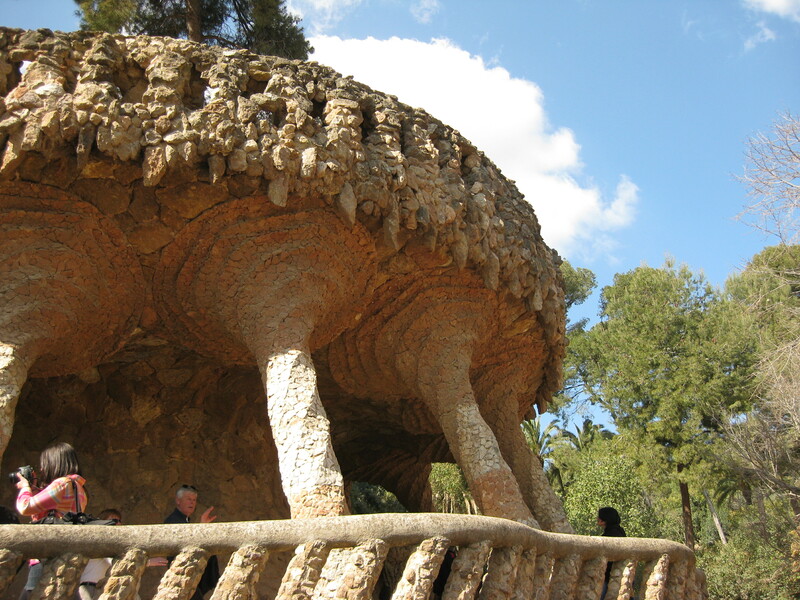 Parc Guell is one of the most beautiful spots! I’m so happy you’re getting to explore all these sites. Talk to you Monday!